AeroShot Energy – A Puff Of What? Every time I think I have seen all possible nonsense in the world of fitness supplements, someone comes up with a new one. Here is to AeroShots. If within the next few months you notice little cylinders hitting the shelves at the supermarket next door and wonder if your local grocery supplier now sells ammunition for weapons usually found in Terminator movies, you probably discovered AeroShot. You are supposed to stick these things into your mouth, press a button and a fine 100 mg caffeine mist will make its way through your throat. Originally the company behind it meant to market it as an “inhalable energy shot”, but in reality you are supposed to swallow it. I don’t know about you, but it seems to me there is a fundamental difference between inhaling and swallowing. That had the FDA scratching their heads as well, probably imagining emergency rooms filled with patients who tried to inhale what is meant to be swallowed. If you see “coolness factor” as a plus for any product you buy, then you can stop reading right now. The marketing behind the product apparently works very well, which is why distribution is now going US-wide. If you are a bitter realist like me, and want to know if AeroShot provides any advantages over, let’s say, having a cup of coffee, keep on reading. On the product’s website,we learn in a FAQ that “caffeine absorbs into the bloodstream at the same rate via the AeroShot as it does following the drinking of a popular energy drink”. Therefore no plus for AeroShot there. But we also are told that we can take AeroShots on board of airplanes and along on “long car rides”, without fear of spilling and getting on the bad side of airport security. Last time I looked, the same is also true about caffeine tablets, which usually have around 200 mg of caffeine per $0.07 pill, while one $3 AeroShot container has only 4 – 6 helpings of 100 mg. Caffeine pills also don’t have to mask their bitter taste by a liberal helping of an artificial sweetener. The principal guy behind AeroShot is a Harvard professor by the name of David Edwards. At Harvard, he heads courses called “Engineering Sciences 20: How to Create Things & Have Them Matter”, which my cynical me would freely like to translate to “Engineering Gullibility: How to Come Up With Something Useless & Find Fools to Buy It”. He also has a website where he personally shows us how great and innovative he is, and already was behind LeWhif (I’m not making this name up), that used the same principle as AeroShot, just with chocolate powder. Yes, I really didn’t make it up. 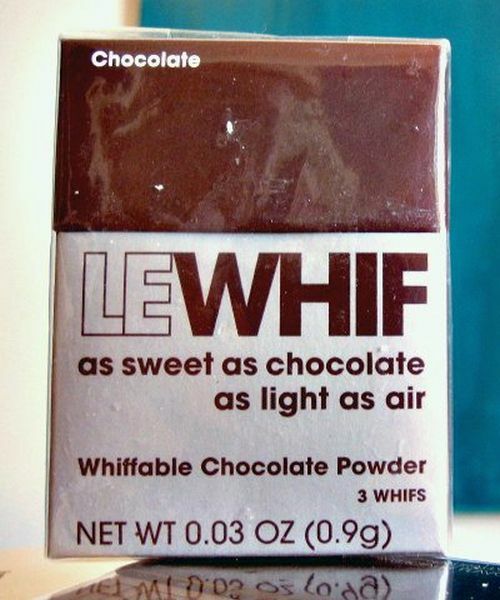 To my knowledge, LeWhif was only introduced in Europe and buyers were raving over it; comments on Amazon UK range from saying it’s like “hot chocolate powder for about 3 puffs, catching your throat and making you sneeze” to “I nearly vomited”. Harvard’s student newspaper is ecstatic over AeroShot, stressing that Edwards had “no commercial intention” when he came up with it. Too bad he couldn’t personally appear for their interview, as he was over in Switzerland, talking with investors. Pictures courtesy of Rob Taylor and “nerissa’s ring“. I would like my cup of coffee in the morning… Cause inhaling caffeine to me personally is a bit weird, I can skip on liquids at the airport. This is a product I definitely will not be buying, but I will shake my head if I see it in the store.